This piece of original art is SOLD. 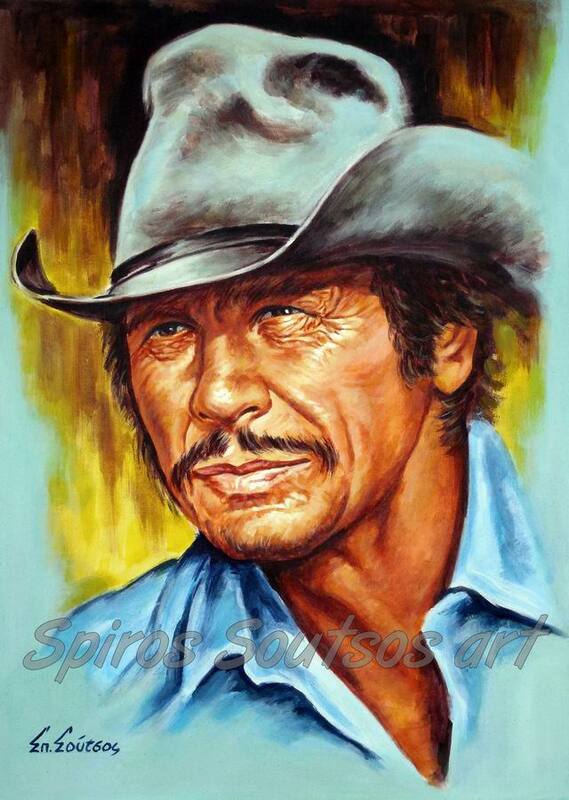 Charles Bronson, the famous American film actor was born on November 3, 1921, in Ehrenfeld, Pennsylvania. He often played tough-guy and made his name on the big screen with roles such as Bernardo O’Reilly in The Magnificent Seven (1960) and Danny Velinski in The Great Escape (1963). Bronson’s first film role — an uncredited one — was as a sailor in You’re in the Navy Now in 1951. Other early screen appearances were in Pat and Mike, Miss Sadie Thompson and House of Wax (as Vincent Price‘s mute henchman Igor).In 1958, he was cast in his first lead role in Roger Corman‘s Machine-Gun Kelly. In 1960, he garnered attention in John Sturges’ The Magnificent Seven ( a film being inspired by Kurosawa’s 1957 film ‘Seven Samurai’) , in which he was cast as one of seven gunfighters taking up the cause of the defenseless peasants. During filming, Bronson was a loner who kept to himself, according to Eli Wallach. He received $50,000 for this role. This role made him a favorite star-actor. In 1968, he starred as Harmonica in Once Upon a Time in the West. The director, Sergio Leone, once called him “the greatest actor I ever worked with”, and had wanted to cast Bronson for the lead in 1964’s A Fistful of Dollars. Bronson turned him down and the role launched Clint Eastwood to film stardom. He also played other “tough guy” characters in such violent thrillers as The Mechanic (1972) and Death Wish (1974). Other films include Robert Aldrich’s war-action film The Dirty Dozen (1967) with Lee Marvin and Telly Savalas, Ten to Midnight (1983), The President’s Assassin (1987), Death Wish V (1994) and Dead to Rights (1995). Bronson died on August 30, 2003.